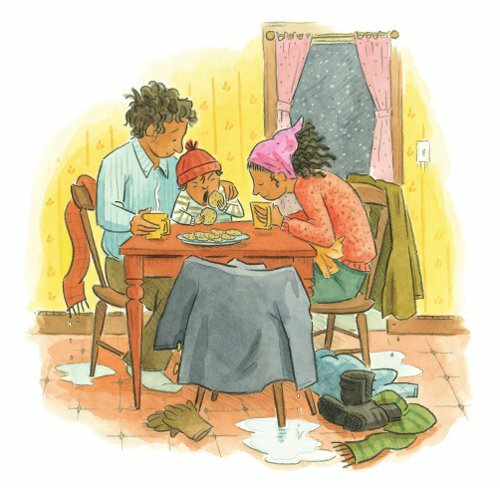 Last week at Kirkus, I wrote about Jonathan Bean’s newest picture book, Big Snow (Farrar Straus Giroux, September 2013). I love this book, which also makes me want to whip up some hot cocoa with marshmallows. Pronto. And today I follow up with some images — some early storyboard sketches, color studies, cover designs, final art (including the illustration above), and such. I read just yesterday the book I’m featuring here today, what the Kirkus review (a starred one) calls “The Arrival for younger readers.” I’m lucky I’m able to show you some of the art from this book, since I asked for some spreads last-minute (this is how I roll), but spreads I have! The book is Here I Am, published by Capstone Press in September. The story is by Patti Kim, and the art is by Sonia Sanchez. Now, I have an uncorrected proof of this, what I was calling a wordless picture book in my head. I see that the Publishers Weekly review (also starred) calls it one, too, yet the Kirkus review describes it as a “slender graphic novel.” Either way, it’s good stuff. I’ll just let the art speak for itself now. Good morning to all. I’m doing something similar this week (to what I did last week). 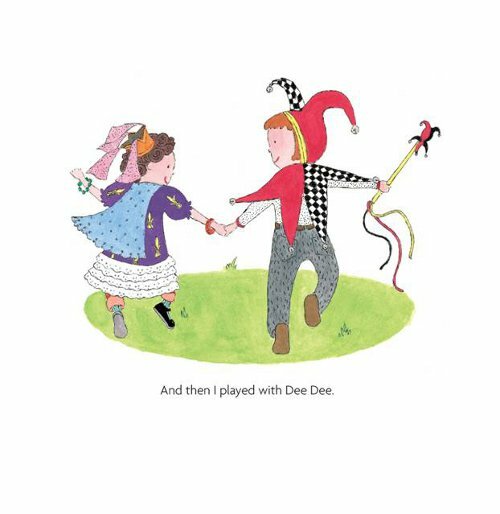 I wrote a review for the fine folks at BookPage of Joan Holub’s Little Red Writing (Chronicle Books, September 2013), illustrated by Melissa Sweet. And since that review is up over at their site, I thought I’d link to it and share some art from the book. Melissa even sent some early sketches from the book, also posted below. 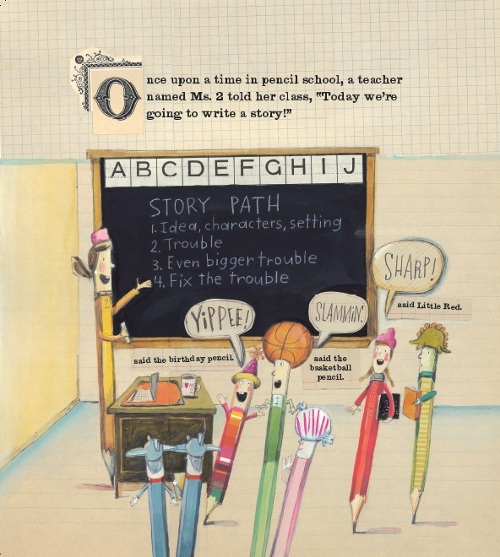 So, to read about this very fun book (special heads-up to teachers of writing in the elementary grades), head on over here. And the images are below. I thank Melissa for sharing the art and sketches today. Have you seen Jonathan Bean’s newest picture book, Big Snow? My, it’s good. This morning over at Kirkus, I write about it. That link is here. 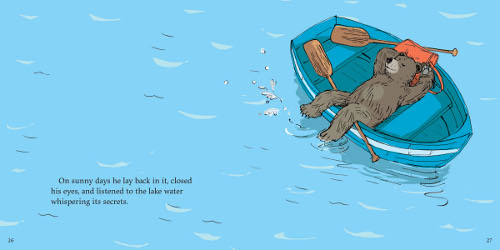 Last week, I weighed in on Eve Bunting’s newest picture book, Big Bear’s Big Boat, illustrated by Nancy Carpenter. That link is here. Below is some more art from that book. This is from Andrea Davis Pinkney’s Martin & Mahalia: His Words, Her Song, illustrated by Brian Pinkney (Little, Brown, July 2013). Last week, I chatted at Kirkus with Andrea about this collaboration, as well as a couple of other topics. That is here. Below is some more art from the book. Pictured above is Matt Phelan’s rendition of author/illustrator Greg Pizzoli, who’s visiting me for breakfast today (and whose human version is pictured left). 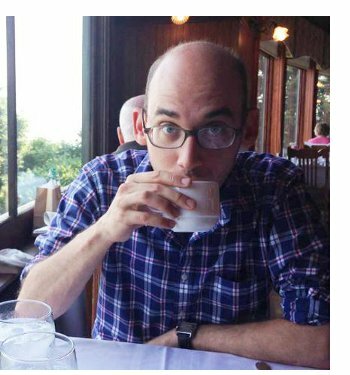 “I turned 30 in January,” Greg told me, “and my wife had some friends and family draw portraits of me for a book she made. It was called ’30 Portraits of Greg. '” So, Greg didn’t send all of those portraits for our chat this morning, but he did send some. Since they’re too fun to pass up, I’m including a few more below, scattered hither and thither. Greg saw his picture book debut this year (more below on how he took that road to publication). The Watermelon Seed was released by Disney-Hyperion in May, and it tells the story of one very worrisome crocodile dealing with what the Publishers Weekly review called a “[c]lassic kid fear.” (This is an “expert debut,” they also noted.) 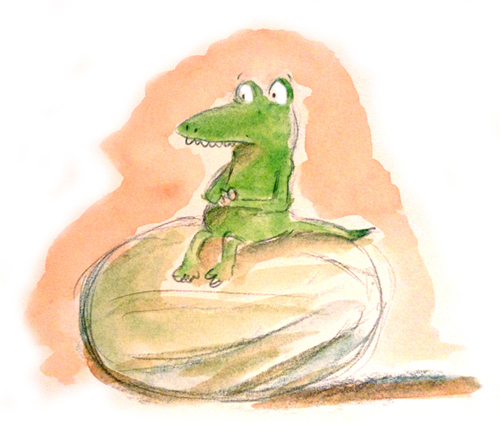 He’s swallowed a seed, and anxiety-ridden children the world over will find humor in the crocodile’s fraught facial expressions. (Vines could grow out of his ears after all.) Using bright colors, screenprints, and hand lettering, Pizzoli lays out a smartly-designed book (co-designed with Joann Hill), which was met with positive reviews all-around. When I asked Greg about breakfast, he told me that coffee is always first. Ah. An illustrator after my own heart. “The tofu scramble with a side of potatoes and a biscuit from Sam’s Morning Glory is my favorite breakfast in Philly,” he added. “They make their own ketchup.” I’ll get the coffee brewing, and then maybe we can think about tofu scrambles for later. I thank him for visiting today, sharing lots of artwork, and letting us know what is next for him. 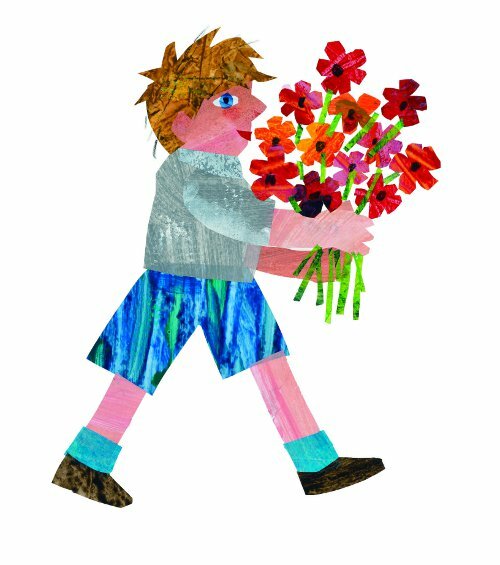 I’ve got some art from Eric Carle to brighten your Sunday morning. Recently, my review of Eric’s newest picture book, Friends (Philomel), was posted at BookPage. As I understand it, it’s slated for a November release. The review—and more about the book—is here, and I’m following up today with some illustrations from it. Enjoy the art. The two spreads below (mountain and forest spreads) are definitely worth clicking-to-enlarge. This morning over at Kirkus, I write about Eve Bunting’s newest picture book, Big Bear’s Big Boat, illustrated by Nancy Carpenter. That link is here. Last week, I weighed in on Amy Schwartz’s Dee Dee and Me, which was posted here. Today, I have some art from the book. This morning over at Kirkus, I chat with Andrea Davis Pinkney about her research for Martin & Mahalia, collaborating with Brian, the state of so-called multicultural books, and more. That link is here. 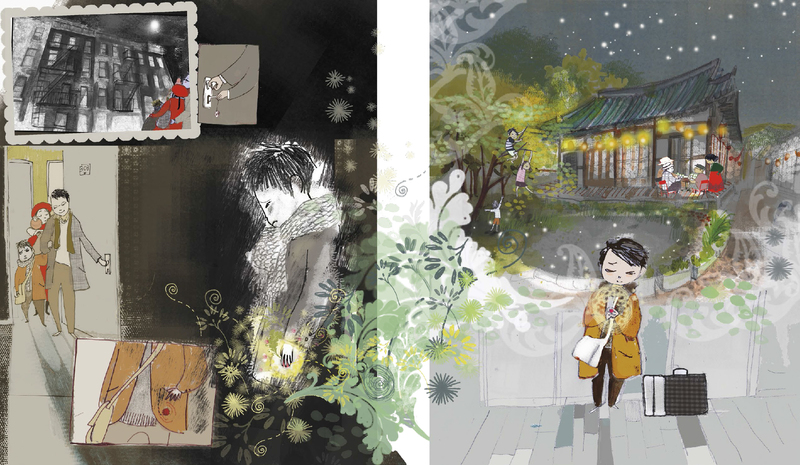 For those who want to see some art from this, her newest picture book, there’s a beautiful spread from Brian over at the column this morning, and next week here at 7-Imp, I’ll have some more of his spreads from this book. 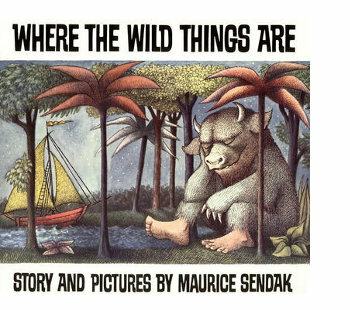 My fellow Niblings (Betsy Bird, Travis Jonker, and Philip Nel) and I decided a few months ago that it’d be neat to coordinate some blog posts today in conjunction with the 50th anniversary of Where the Wild Things Are. Yep, it’s 50 years old, having been originally released in Fall 1963. And, after some digging/research, we figured out that its release was in October of that year. But it wasn’t until this past weekend that I saw it in an all-new light. Here in Nashville, we celebrated the Southern Festival of Books. Philip and Erin Stead gave a great talk on Saturday, and Philip spoke lovingly at one point about this very page. And he said—and I paraphrase—that one of the distinctive things about the way Sendak chose to end the book, illustration-less as it is, is that it lets child readers supply their own artwork in their minds’ eyes. And that is, quite frankly, a brilliant and gracious thing. I have always loved this page for the deep breaths it takes; for the space it gives readers; for its simplicity; for what it says about unconditional love. But I’d never thought of it in the way Philip discussed it, and a little light bulb went off above my head. And that is all I have today for the book’s birthday. A recent vacation, as well as the Festival, have me behind on my work. But it’s my small contribution to anniversary wishes for a really big book, the picture book that changed the very landscape of children’s literature. Philip Nel, “It’s a Wild World: Maurice Sendak, Wild Things, and Childhood” at Nine Kinds of Pie. Travis Jonker, “Books on Film: Where the Wild Things Are” at 100 Scope Notes. Betsy Bird, “Re-Sendakify Sendak Project: The Results” at A Fuse #8 Production.